“High Intensity Petroleum Operations shall not be an allowable use in any land use district and shall be otherwise prohibited over, under, on, within and through all of the land governed by this Land Development Code” and goes on to say, “the storage and/or disposal of High Intensity Petroleum Operations Waste Products shall not be an allowable use in any land use district and shall be otherwise prohibited, over, under, on, within, and through all of the land governed by the Land Development Code. This prohibition shall apply regardless of whether the surface access point for any such storage or disposal operations is located on land governed by this Land Development Code”. The Madison County fracking ban is yet another rejection of the controversial industrial practice of the oil industry that follows other counties, such as Volusia County and the City of Bonita Springs, that have adopted local legislation that specifically bans hydraulic fracturing, pointing to the extensive social and environmental risks implicated by the industrial practice. 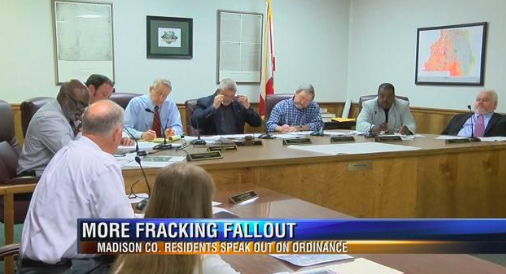 Already nearly three dozen counties and fifty city councils have adopted similar ordinances and resolutions, expressing their opposition to fracking and/or calling on the Florida State Legislature to pass a State-wide ban on fracking.